I am not an expert but I do try my best to learn about an archive with care. I study the website thoroughly and then prepare what I want to do so that when I get there I can make progress. 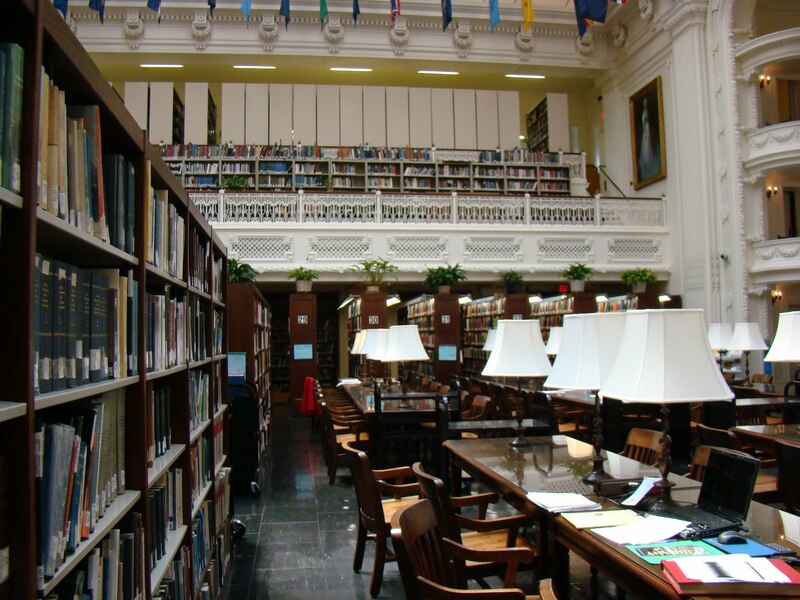 The one thing about the DAR Library is that you can access a lot of the books in the stacks yourself. You start on the main floor. This time I noticed that a lot more of the library catalogue items had been digitized so that meant I would be in the Seimes Technology Center as well as the main library. My first goal was to find the Cooley Association Bulletin again. I had worked on it the last time and then when I returned home I found I had missed some pages and didn’t write my sources down correctly so I didn’t know what the pages were. No matter how hard you try when you are traveling these types of things happen. So I knew I had to fix it or it would drive me crazy. The problem was I forgot where the bulletin was in the library. All I remembered was it was up and not on the main floor. 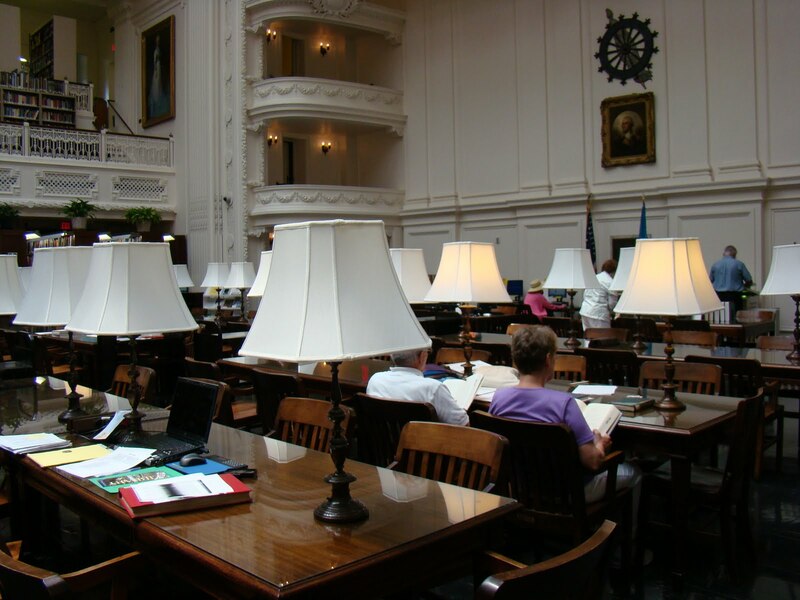 The DAR library is divided into the Main room with tables, copiers, the reference desk and all the stacks with general books and then they start with the states. However, a lot of books are up on the balcony areas and that means you have to go out the two back doors and walk up the stairs and into the upper area. The DAR is very clever they have those rolling stacks so there is a lot more upstairs than you think. Climbing around up there is like a maze but kinda fun! They use to be the balcony area of the assembly room. Well it turned out that the Cooley Association Bulletin was upstairs on the balcony to the right of the reference desk in the OV – over sized area. Of course it was on the top shelf about 1/4 down from the left. I had to climb up and carefully remove it. It was a big legal sized red book with about a decade of these bulletins bound inside. It was all coming back to me how the library was set up. I returned to my seat and began going through the pages which had been typed. The range was 1939 to 1951 for the bulletin. Paul H. Goss had written about the Goss family in this bulletin and it spanned several issues so I had to revisit the whole sequence to check myself. There were also a few extras to get the volume, date, issue number and page as well. Cooley Bulletin 2nd floor to the right on top! You can see my stuff on the left in this photo and others busy with their research. I was told I could photograph the library but not the books and resources, those had to be copied. The next chore was to seek out sources listed on a DAR application that I had purchased the last time. The patriot was Stephen Delano and the only application on his line came up through his daughter Elizabeth. They had listed two histories one of Windsor County and Woodstock, Vermont. I had obtained the Woodstock part that last time but I revisited it anyway just to be sure. The Windsor County was on microfilm so that meant a visit to the computer lab. This means I have two potential patriots to choose from for my initial application and then follow up with a supplemental. I tried finding a GRC but that too was in digital format. The DAR has been very busy putting more of their records on the computer. They had done a lot the last time but I was seeing evidence of even more progress. If you have a Cooley ancestor in your background you need to know about the Cooley Association and go to their website at http://www.cooleyfamilyassociation.com/ I have not joined yet but plan to. It requires that you be a descendant of a Cooley ancestor and provide the usual documentation. They have reunions and it looks like it is every 2 years. There is also a book written by Dean Mortimer E. Cooley titled the Cooley Genealogy that you should also check for information. The bulletin above that I mention may have more information about other lines in the Cooley genealogy. As for additional copies well you might find them in other libraries, societies and archives.